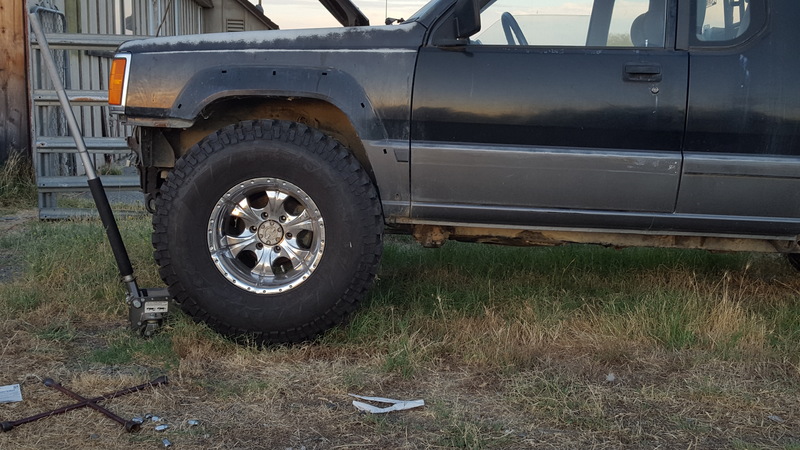 I test fit my new-to-me Helo rims with 315/75-16 tires on the left side of Pearl this evening, snapped some pics, and really wished the truck wheel openings were as large as the Montero. Shucks! 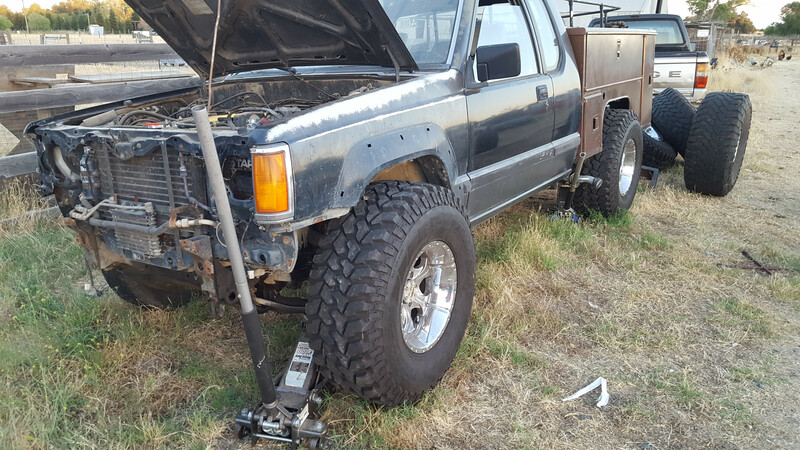 I have not been a proponent of body lifts through the years, nor wheel spacers, but I'm going to add some height to the cab. 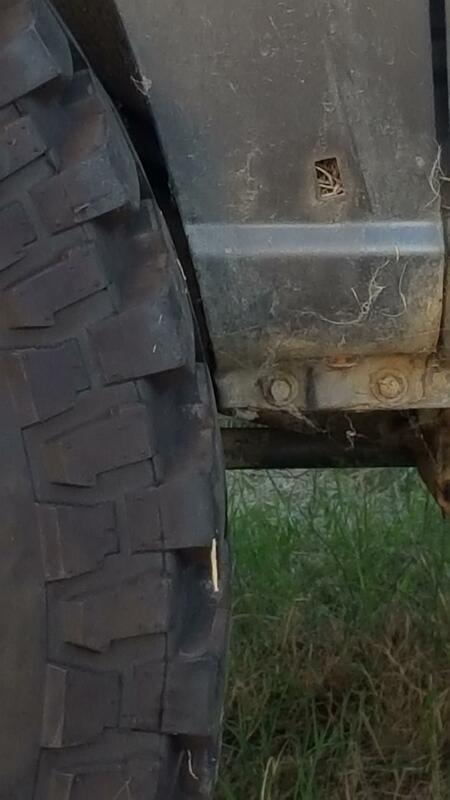 Chatting with Joshua on FB, the ADD pieces net about 1.75" of lift? I am taking a stab in thinking that may not be enough alone. I will likely trim fender clearancing, as needed; however, I'm interested in collecting opinions. Prior to purchase of a BL kit, I have Lloyd's old torsion bars and some SR UCAs to install. Thoughts? Try the ADD lift? Go right to a 4x Crawler 3" BL? Not much tech regarding the Max upgrades when most guys quit at 33" treads. I put 3" on my Gen 1 max to clear 35's and I'll still need to trim fenders. Mighty max isn't built to be a big tire truck. Sacrifices must be made. Cool. Saw is at the ready! Do it! and run Lloyd's T-bars, coil spring the rear. How in tarnation did I miss this before? Damn Russ! Now I feel the utter fool asking you about 31s on Mine. LOL. I hear you on BLs. I went through a similar debate years ago on Betsy3 (my last gen1, the LWB). I ended up going 2 inch. It's not an elegant solution but it does offer some advantages, over and above tire clearance, provided you're willing to work the details (of course you know this all already). Clearance for transmission, clutch, etc is greatly improved. Ability to lift gas tank is nice (not sure if this is the case with the truck?) Just the general roominess added is kinda nice. Course you may have to extend brake lines. Gas tank filler. Reposition shroud. Tcase shifter room. Trans linkage if auto. Etc. Etc. But if you're running 35s on a max then these are pretty minor inconveniences right? Hold on. You can use montero UCAS? Serious!y? I'm so behind the loop in pickup world. Phil, I've been exploring the dark side for sometime with Pearl...you know all them pirate waters? I need to confirm which Montero UCSa, do the body lift and trim what remains. As to the 31s on your Strada, I would not mess with that ride. As we've discussed in other threads and conversations, Pearl is going to be a Swiss Army knife. The addition of the service body will make the fuel fillers (yes, 2) relocated, anyway. I'm adding a rear fuel tank from a 4-cyl SWB Montero that will be slave to the primary tank. I may try to use the larger FI tank from the Sport parts car as the primary. The other things will fall in place as I add the disc brake rear axle and cut down Ramsey winch bumper. Something that looks great in my head is the 'decreased apparent height' of the 5-speed shift lever that is way too long. I have a 21-gallon water tank I'm trying to find room for, too. 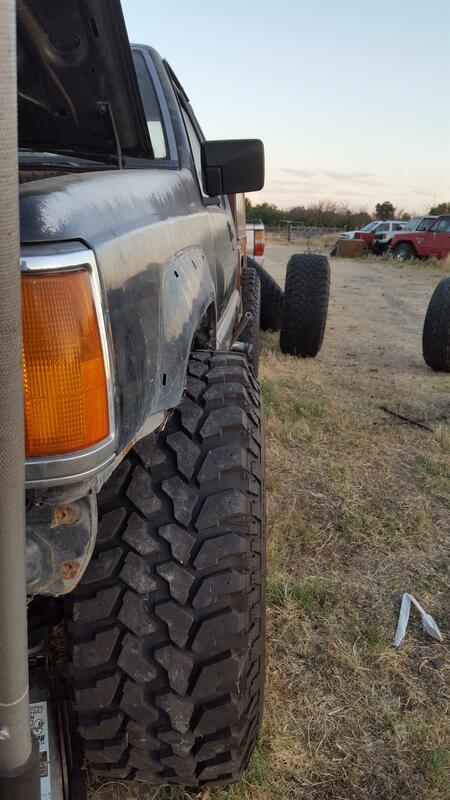 I have 94 Montero UCA and LCA on my 84, they bolt straight on. need the CV's as well. longer. What's the gearing of the '02 MS? I've heard it mentioned the seats may fit, or be 'close' to fitting. I'm fairly certain the Gen 1 V6 front diff is low pinion. Adding the Aussie locker to the high pinion front diff out of the '02 MS, w/4.9s and no CAD, would be stronger, and based on what I've read, better suited to the V6/35" combo you're running. You're running a '97-'99 MS 9" rear end correct? Is the '02 MS a 3.0 or 3.5? If it's a 3.0, the rear high pinion 4.90 diff should swap right in, or if your rear end has an oem air locker, at least the 4.90 r&P will swap over. Whether you plan on using them or not, the 4.90 diffs, esp the CAD free MS front, seem to be sought after by Gen 2 guys running larger tires and would be worth pulling before scrapping the MS.